Symphonic middle eastern black metal band Tamerlan Empire from Sydney, Australia (with roots from Uzbekistan) proudly presents its highly anticipated debut full-length album titled “Age of Ascendancy“. The album is released today digitally via Metal Hell Records, featuring 11 tracks of symphonic middle eastern black metal with real ethnic and orchestral instruments. The CD version, also via Metal Hell Records, is scheduled for the beginning of March 2018, presented with an 8-page lyrics booklet housed in a crystal clear jewel case box. It will also include a free 1.25″ pin back button, vinyl logo sticker and download code for the digital version of the album. It is already available for pre-order in their label’s official web-store. The great conqueror known as Tamerlan rose from very humble beginnings to eventually lead one of the most powerful empires of the 14th century AD. “Age of Ascendancy” perfectly describes both his meteoric rise, as well as the era in general where empires strove for dominance through war, bloodshed and destruction. 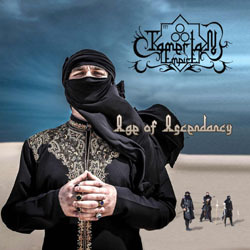 Many of Tamerlan’s tales of battle are the driving force of the songs on this album, as well as more ethereal concepts of life and death, greed and deception. These attributes, which have driven humankind to ultimate power and ascendancy, are in many ways also responsible for its greatest failure. The lessons of the past seem to never be fully learned and continue to repeat themselves even today.